This article appears in the beer guide for the World Beer Festival Durham, produced by All About Beer Magazine. We hope you’ll join us in Durham on Saturday, Oct. 10 to sample from more than 250 beers and ciders. In 2013, Andrew Fisher was on the final leg of a cross-country trip, moving from Denver, Colorado, to Durham, North Carolina. While spending a night in Asheville before his last day of driving to Durham, he struck up a conversation at a bar, eventually chatting about beer in Colorado and what he could expect once he arrived in the Bull City. But mostly, he wanted to know what beer he should buy. It wasn’t just because of the breweries in town. In 2013 there were just a few. Now there are six, including Bull Durham Beer Co., the only brewery in the country located inside a minor-league baseball stadium. Fisher was surprised to find a new element in the burgeoning beer culture, mixing the idea of retail sales and the neighborhood bar—the bottle shop. The stores weren’t just an opportunity to stock up on bottles or cans of local beer, they also offered a new destination for Fisher to sit, sip and shop. Increasingly across Durham, that’s becoming a reality to residents in all corners of the city. Since Fisher arrived two years ago, four bottle shops have opened, bringing Durham’s total to five locations that sell packaged beer while also offering bar service. That doesn’t include other retailers that focus on bottles or cans only, like Hope Valley Bottle Shop, or tap and growler sales, like Growler Grlz, which pours from 42 options at the bar. As North Carolina’s beer scene has matured, so too has Durham’s, which is shifting beer drinking experiences away from bars and restaurants to locations offering specialty tap takeovers, creating new events and, most important, providing a popular way to taste and buy beer. At The Glass Jug, this comes to fruition in all sorts of ways, from staff with Cicerone certifications to weekly community engagements, like an intermediate-level bike ride, knitting and crafts club and “Just Us Gals,” a female-only educational and social gathering. Recently, The Glass Jug hosted Highland Brewing Co. president Leah Wong Ashburn to discuss the role of women in the beer industry. 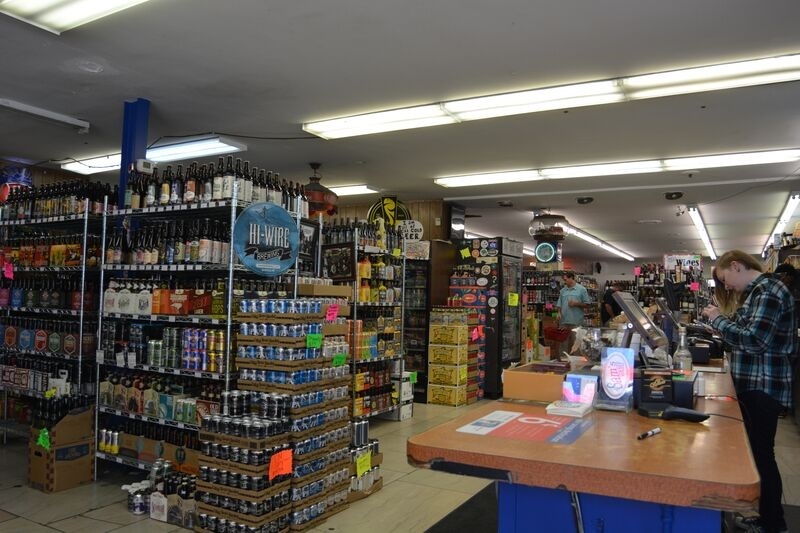 The longest-tenured spot in Durham to offer that kind of community is Sam’s Quik Shop, the city’s original hot spot for beer when Gerry Boy started stocking shelves with imports like Duvel and Orval in 1974. Today, her son John Boy Jr. oversees Quik Shop, with tightly packed rows of hundreds of beers and 12 taps, as well as Sam’s Bottle Shop, a 28-tap retail outlet with just as many packaged beer options as the original store. Sam’s is known for weekly tastings and tap takeovers that draw beer lovers from across the Triangle, and John Boy says the ultimate goal of both locations is to offer an experience unlike a bar or restaurant. In August, he teamed up with Creech to host a two-day sour and wild beer event at Sam’s Bottle Shop and The Glass Jug to serve a curated selection of rare beers and get people talking about the style, which continues to grow in popularity. Just a quarter-mile away from Sam’s Bottle Shop, customers can find a unique experience at Bull Craft Bottle Shop, which sells only beer made in the Tar Heel State. In a space the size of a large living room, the store serves from eight taps with a half-dozen shelves full of locally made beer from North Carolina’s coastline to its mountains around Asheville. 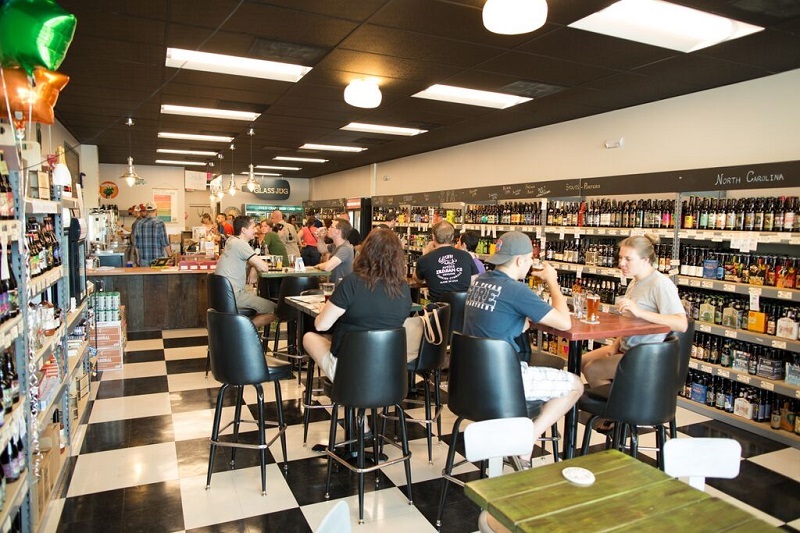 Medders means it in several ways, both in terms of the evolving beer scene across North Carolina, which now has more than 130 breweries, but also the role bottle shops play in the beer industry. With growing consumer interest in buying local, starting a business that catered to the state’s breweries seemed like a no-brainer. It offered a chance to highlight beer Medders felt Durham residents were clamoring for and educate them through a new kind of customer experience.